Epoxide Oil Gel is a thixotropic painting medium made with dicyclopentadiene copolymer linseed oil and pyrogenic silica. Epoxide Oil Gel is a translucent yellow gel that adds transparency and thixotropic body to oil, resin-oil or alkyd paint. Add directly to your paint to give it transparency without thinning its consistency. Add pigments or extenders to thicken it for creating impasto effects that do not sink in. 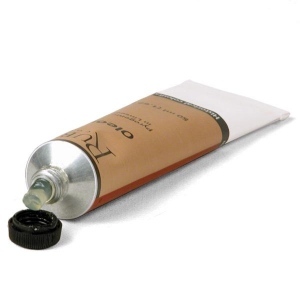 Epoxide Oil Gel does not contain driers or solvents, so it is safe to use in oil painting without worry of cracking. When mixed with oil colors, Epoxide Oil Gel will decrease the drying time. Epoxide Oil Gel is tacky, so we do not recommend adding more than 20 to 30% to your paint. To make your own paint with Epoxide Oil Gel, add directly to pigment powder until a stiff paste is obtained (almost the consistency of putty). Grind the paste with a muller on a flat surface before storing in collapsible tube. Some of its thixotropic property will be temporarily lost when grinding Epoxide Oil Gel with a muller, but should be restored when allowed to stand. There are no acute or known chronic health hazards associated with the anticipated use of this product (most chemicals are not fully tested for chronic toxicity). Always protect yourself against potentially unknown chronic hazards of this and other chemical products by keeping them out of your body. Do this by avoiding ingestion, excessive skin contact, and inhalation of spraying mists, sanding dusts and vapors from heating. Conforms to ASTM D 4236.